Jim Caldwell of Glasgow company JCJ Demolition and Construction Ltd has been given a Lifetime Achievement Award. The accolade from the National Federation of Demolition Contractors acknowledges his “outstanding and ongoing commitment” to improving training and ensuring workers are competent and safe. Jim (right) receives his IDE fellowship in November. 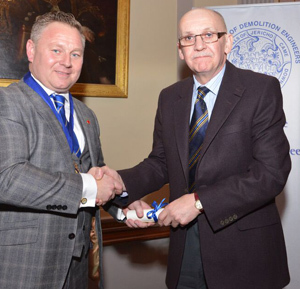 The NFDC achievement is the second time in recent months that Caldwell has been recognised for his work; in November he was awarded a Fellowship of the Institute of Demolition Engineers at the AGM in London. JCJ was formed in 1991 as a family-run business and is a founder member of the National Demolition Training Group (Scotland). Another NFDC winner from Scotland was Norrie Grant of Bonnybridge firm Central Demolition who took the Demolition Supervisor award.